A new report out from FASTBOOKING reveals that the average hotel website conversion rate is only 2.2 %. Furthermore, the same report also tells us that the top 20 % of hotels convert at a rate of 5.6 %, while the bottom fifth only convert at a pitiful 0.3%. Clearly, the spread in between leaves a gulf of disparity. For hoteliers wanting to get a grip on how to bring their properties into optimization, this FASTBOOKING paper offers help. Before launching into the report, it’s important to establish a baseline of understanding about just how each hotel can glean how to improve individual property variables and overall rates, instead of simply trying to meet an industry median. As a “for instance” on how to achieve this, FASTBOOKING has a gigantic warehouse of hotel website data by virtue of their position as a hotel distribution company. So, crunching the ensuing data from the spectrum of hotels, prperty types, and geolocations, FASTBOOKING is able to advise clients on needed steps. As the saying goes, improving by emulating successful methods is “not rocket science”, even though analyzing data can be. Anyway, the following is based on FASTBOOKING research, their experts, and client advisors, the company has gleaned many answers for clients. 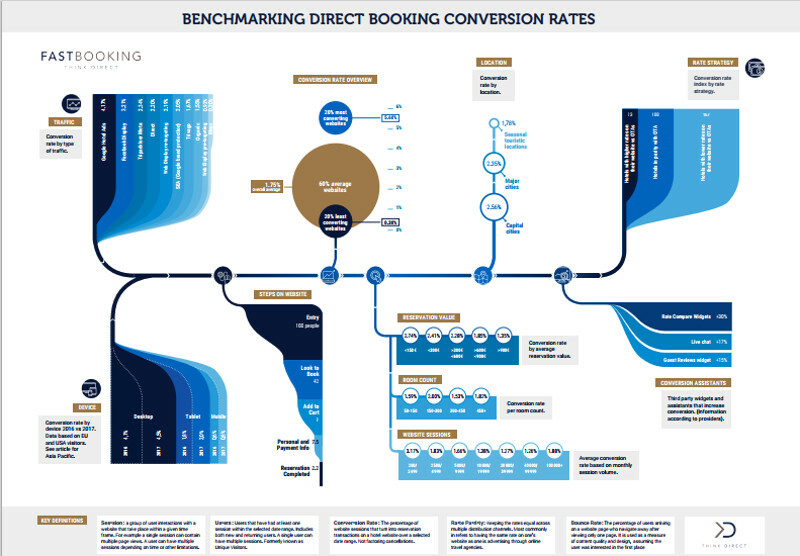 Before reading the findings, we recommend readers download this FASTBOOKING infographic to make sense of the findings from FASTBOOKING CMO, Jean-Louis Boss. Is a question we get asked very often, answering it may be way harder than you think. First of all, what do we mean by the term conversion? According to Google, a conversion occurs when a website visitor (or app user) performs an action defined as a goal. This leads to the next logical question: what does that mean for the hotel industry? In Hospitality, with the generic term conversion rate we refer to the ratio between the website sessions and completed reservations. To measure a hotel website’s conversion rate and keep an accurate comparison we have defined conversion rate as the number of reservations made compared to the total number of sessions of a website for the same time period. We have also decided to present data using last click attribution model only. As you may know, the limitation with this model is that it gives 100% of the conversion credit to users last touchpoint, making it hard for marketers to measure interaction and brand engagement through the whole booking journey. On the other hand, even though conversion attribution is one of the hottest topic in our industry (especially since Google launched a free simplified version of Attribution 360back in May), it is still common practice to calculate conversion based on users last interaction with the brand and chances are that you or your web agency are using this model as well. So, for the sake of ease and in order to provide numbers you can easily compare with your own, we preferred to use last click attribution model, despite its intrinsic limitations. We also decided not to take into account any cancellations. According to a Mirai study, hotel official websites have an average cancellation rate of 19 %. That it is, therefore, a variable you may want to take into consideration when calculating your conversion rate. So why we decided to discard cancellations? The reason for it is that cancellations usually happen closer to the stay day, thus the current month’s conversion rate (with no cancellations yet) compared to the conversion rate of same month last year (having retroactively removed cancellations) would give a false sense of improvement. Let’s assume this is the conversion rate of your website in November 2017. To simplify even more, let’s pretend that all these reservations are done for December and January. In those two months, anyway, 27 reservations will be cancelled. Now, if you look at the above example again, you will see that those original 144 reservations turned into 117 real ones, lowering your conversion rate from 2,2 % to 1,78 %. But, as you will not be able to analyze your data retroactively for the current month, if you do not discard cancellations when calculating your conversion rate, this will always look better than the previous year, even though it may not be. As a final note on the methodology used: as stated in the opening, it is crucial to keep things in perspective and understand the bigger picture when calculating conversion. Larger room hotels tend to have more traffic and, thus, lower conversion, because they usually do not sell exclusively rooms, but congress facilities, F&B services and wellness treatments as well. All these ancillary services attract a lot of traffic on the website, but it is mainly local traffic that is unlikely to convert into room bookings. Even though meeting requests, dinner reservations and massage appointments are (in fact) conversions, in this study we are focusing exclusively on room transactions. So, if your hotel sells non-room services as well, we suggest to segment your traffic in Google Analytics by excluding the sessions of the meeting & events, restaurant and SPA pages and re-calculate the conversion rate based on the remaining traffic, filtering these users out of the data set. Dozens of variables play a role when it comes to conversion rate. One of those is the quality of traffic. As a general rule, the more pertinent the traffic the higher the conversion rate. With that in mind, it comes with no surprise that targeted advertising campaigns register the best conversion rate, with Google Hotel Ads at 4,17, Facebook Display at 3,21 and TripAdvisor metasearch PPC Ads at 2,34 % respectively. Google AdWords, when used to protect the hotel brand name, has an average conversion rate of “only” 2,05 % but this data is not entirely surprising when put into today’s market context. Back in 2014 Tom Mulders, Google’s senior program manager for GHA (Google Hotel Ads) , publically stated that “Google is expected to gradually shift more and more traffic to Google Hotel Ads, possibly at the expense of AdWords and organic SERP”. With Google slowly but surely pushing organic results and Adwords below its metasearch, it is normal to see a decrease in conversion for search engine ads, as visibility plays a big role in CTR and, therefore, conversion. Retargeting tends to convert extremely well (2,19 % conversion rate), over twice the average conversion of display pre-targeting (0,92 %). That is normal, as the users that visited your website showed an active interest in your property and they are way further the booking journey funnel. In those cases, a little extra push from retargeting can really boost your conversion rate. Advertising aside, direct traffic is, obviously, one the most qualified source and with its 2,20 % conversion rate, falls just behind Google Hotel Ads, Facebook display and TripAdvisor metasearch ads. Organic search, on the other hand, performs averagely, with a 1,55 % conversion rate, this comes partly for the same reasons as the lower AdWords traffic and partly because organic search also includes “long tail” traffic such as “spa in London” or other such traffic which doesn’t convert into room nights. It’s interesting to highlight that even Trivago, historically a great source of traffic but not always satisfying in terms of ROI, have a slightly (+0,12 %) better conversion rate than organic traffic. At the bottom of the conversion rate podium, unsurprisingly, we have blogs, with only a 0,20 % conversion rate (to put data into context: blog conversion is 20 times smaller than Google Hotel Ads conversion), indicating how much blogs and influence marketing, in general, tend to affect the “I want to get away” micro-moment, when the traveler is still at the early stages of his planning. This doesn’t mean the traffic isn’t important, it is part of your brand awareness, but since it is so early on the conversion funnel it is not often visible especially not on the last-click model. We recommend hotels have highly optimized hotel websites to take in the increased traffic, use other means of contacting the guest such as chat and call-back systems to interact with the guests so they can make their reservation through other channels. And to work with providers that can accept the mobile payment systems. “Location, location, location” is a phrase associated with real estate and hotels since the 1920s. That is why a study on conversion rate cannot ignore this important variable. We broke down our hotel panels into three main categories: capital cities, major cities and seasonal touristic locations. Results were pretty apparent, with properties located in capital cities (2,56 % average conversion) overperforming major cities ones (2,35 %) and seasonal touristic location (1,78 %). This is not entirely bad news for touristic location, as it is important to highlight that, while capital and major cities hotels tend to sell their rooms directly to the final guests via their official website and OTAs, seasonal hotels and resorts rely more on intermediaries that sell the hotel indirectly to third parties (tour operators, wholesalers, travel agencies, GDS, etc.). Another unsurprising factor that highly affects conversion rate is the average hotel price. Of the data set we analyzed, properties with daily rates below 150€ per night have twice the conversion of the ones selling at 900€ and above (2,74 vs 1,35 %). Booking a cheaper hotel, a motel or a B&B is obviously an easier action than organizing a luxury travel, so expensive properties are disadvantaged in terms of pure conversion rate, even though the average booking value is way higher than cheaper properties. Besides the higher end hotels also have still a larger number of phone reservations as guests want to make sure their needs are taking into consideration. On the ADR variable case, the data we analyzed formed a clear descending curve: hotels between 150 and 300€ ADR have a conversion rate of 2,41 %, hotels between 300€ and 600€ 2,28 and hotels between 600€ and 900€ 1,85. There are more factors that come into play on this which is how high end hotels also tend to have more sessions and often sessions for people who are just curious about the hotel. It often happens that they are mentioned in an article or on social media which inflates the website sessions. This, anyhow, is not the only conversion variable when it comes to prices: in fact, offering a better rate on your official website can boost conversion by up to 67 %, while giving discounted rates on OTAs and other distribution channels can decrease it by 77 %. Non-refundable rates have 3 times lower chance of conversion than flexible ones, so make sure you offer a refundable rate to your potential guests. In conclusion, hotels with lower ADR that breaks parity rate tend to have the best conversion rate, while more expensive hotels that respect rate parity contract clauses are more likely to underperform when it comes to conversion rate. To help break down how the booking funnel happens on hotel websites, we worked out the averages based on how it would look like if 100 people were looking at the average hotel website. We’ve tried to help explain the various steps to illustrate how the path develops. For 100 visitors entering the website about 42 will click to check rates (and/or availability) this shows an interest in the hotel but too many variables are still unanswered and the drop off will be substantial. From the 42 visitors that are interested in the hotel, 9 will find that the rates and availability fits their needs and move to further step in the booking process. But they still need to complete the reservation. From the remaining 9 visitors, 7.5 will click through to the credit card and personal information page. Some will return to another channel to book because their payment data and personal information is already stored. Some will click through to verify that there are no hidden costs. 2.2 will complete the booking. Driving qualified users to your official website is obviously very important, but it is even more important to give these users a proper page to land on, a poorly designed website with a frustrating User Experience can dramatically reduce your conversion rate. How can you make sure your official website is ready to transform users into guests? A couple of months ago we wrote a full guide and infographic about how to choose the right distribution solutions for your hotel, with an entire paragraph dedicated to web design best practices, so you may be interested in reading it to deepen the subject. There are some basic rules to follow when it comes to web design for hotels, with the most important being: choose a web agency with proven knowledge of the industry. Most of travelers are looking for answers to three questions on a hotel website: Rooms, Rates and Location, so it is crucial to clearly answers those questions as fast as you can. An agency specialized in Hospitality knows how the average user behave on a travel site and will design the website based on those behavioral patterns. Here at FASTBOOKING, for example, we have frequently doubled the conversion rate of several of our clients just by upgrading their website’s design. A frictionless design website with high definition professional photos can have a dramatic impact on conversion, as it creates an emotional impact on the user. Kevin Roberts, CEO of Saatchi and Saatchi once stated that “reason leads to conclusions, emotion leads to action.” And, as we wrote in the introduction, a conversion is nothing else that a specific action users do on websites, so do not underestimate the power of emotion when selling your rooms. 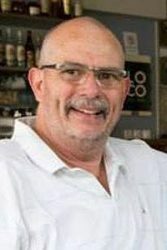 Another important conversion variable is the time it takes to load your website: an Akamai research showed that a 1 second delay in page response can result in a 7% reduction in conversions, so make sure your website is hosted on a proper servers and use content delivery network (CDN) in order to quickly load pages to virtually every user in the world. We already explained how mobile took over desktop in internet usage, so it is easy to understand that responsiveness of your website is another crucial factor when it comes to conversion rate. With all that in mind, every website need tweaks and adjustments from time to time so, in order to be sure that the User Experience on your website is frictionless, analyze your website’s bounce and exit rates frequently, test the page load time from different locations and if you really want to understand how people use your website, install a heat map tracking system. Even when all the previous points are optimized, there is still some room for improvement: third party widgets, in fact, can really boost your conversion rate, provided that they are chosen according to your specific needs. According to our data, for example, price comparison tools (widgets that displays real-time OTA prices together with your website’s) improve conversion by an average 30% but, if your hotel is respecting OTAs rate parity contractual clauses, this kind of implementation could not be the best way to go. Same goes with review widgets: integrating one of them on your site or on your booking engine can boost conversion up to 15%, but if your reputation is not pristine this can be a boomerang. A live chat (whether a human being or a bot is behind them), on the other hand, is always a safe choice: +15% conversion improvement on average, no matter your rates nor your TripAdvisor ranking. Widgets are a great opportunity especially for independent hotels: you can easily integrate them without developing the whole technology from scratch (usually you only have to add a few lines of code on your website) and they are relatively inexpensive. There are several companies out there providing quality tools: TripTease, for example, even though it started offering a wider range of products lately, is mainly known for its state-of-the-art price comparison widget, Hotel Direct Booster offers a beautifully designed live chat system, with an average speed of answer of only 30 seconds and TrustYou’s semantic technology processes billions of data, providing easy to read aggregated review score, in order to give travelers all the key info they are looking for. As you have undoubtedly noticed there are many factors that affect the conversion rate of a hotel website. Many you can control (rates or reviews) and many that you don’t control (location or availability). Rates: having competitive rates and offering a better rate to the travelers for booking directly on your website is the single most efficient way to increase your conversion rate. Trust: having great reviews will affect your conversion rate. A recent research by Donna Quadri-Felitti, academic chair and clinical associate professor at New York University showed that, given equal rate, travelers are almost four times more likely to book a hotel with higher review score. Service: Showing that you can offer a better service such as more flexible rates or other benefits will encourage conversions especially if this is something unique that is only offered on your website. Looking only at conversion rate one can miss the bigger picture which is the number of sessions and the revenue it generates. Measuring one’s website efficiency is a composite of website sessions, conversion rate and revenue one must balance those three to achieve the final benefit of profitability which enters the fourth factor and that is resources spent to achieve the revenue. When it comes to widgets which help improve all aspects of hotel marketing it is essential solution these days, because – as we all know – the majority of industries are developing by taking advantage of technological progress. There are a wide range of various widgets for hotels, however, one of the most outstanding is Our.Guide widget. It is worth trying while planning your hotel marketing strategies.